This paper uses an action research intervention in an attempt to improve student engagement with summative feedback. The intervention delivered summative module feedback to the students as audio recordings, replacing the written method employed in previous years. The project found that students are keen on audio as an alternative to written feedback, perceiving it to be clearer, and more comprehensive and accessible. The use of spoken language allowed inflection and context in a manner absent from written feedback. 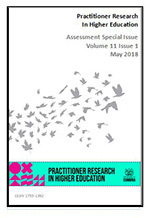 Additionally, students stated that they were more likely to revisit feedback recordings in conjunction with their written materials, indicating a willingness to reflect upon their work. The project found that challenges of practical implementation around both the creation and dissemination of audio feedback can be a hurdle to engagement with this technique.